An 88th minute equaliser for Walsall means both sides remain unbeaten this season. That late goal was good news for the 3 who got this spot-on, and the 2 who had the outcome. The other 27 members predicted a win for Barnsley with an incredible 18 going for a 2-1, in what was the weeks most predicted result. Joe Pigott's fifth goal of the season was enough to earn AFC Wimbledon their first league victory since the opening game of the campaign. Nobody had this spot-on, and only 2 got the outcome. There were 23 who predicted a win for Gillingham. Sunderland remain unbeaten in the league despite going behind for the fifth time this season. Well done to Stupid_Gooner for being the only one to get this spot-on, especially as the other 31 members predicted a win for Sunderland. Cheltenham claimed just their second victory of the season, as Northampton remain with just the one, against you know who. No points for anybody here, with 25 predicting a victory for Northampton. Newport won their second away game on the bounce as a single goal was enough to see off Oldham. Well done to thrillseeker for being the only one get this spot-on, though 7 did have the outcome. Danny Newton scored his first goal of the season as Stevenage beat a Macclesfield side still without a win this season. There were 5 who had this spot-on with a further 22 getting the outcome. Another week where all the home teams were well supported, with a number of members going for all home wins, but only Stevenage read the script, and saved the week from being a complete disaster. Their 1-0 win produced 37 of the weeks 63 total points achieved, and saved 16 members from having a blank week. On such a tough week RSCOSWORTH did well to be the only one to have two 3 pointers, the Barnsley 1-1 and the Stevenage 1-0, and he is the weeks top scorer with a decent 6 points. Best of those who had one spot-on was Stupid_Gooner, who was far from that with the good Sunderland 1-1 pick, and two outcomes gave him a very good 5 points. A reminder of a rule. If any member post two lots of predictions in a week, I will go with the first ones posted unless it is stated the second ones are to replace the first ones. In that case there is no need for a second lot, just edit the first ones please. In the Premier That top scoring effort from RSCOSWORTH enabled him to increase his lead at the top by a further 2 points. By having the Barnsley 1-1 spot-on gsy163 made sure the deficit was not any more than 4 points. Another to benefit by getting the Stevenage 1-0 spot-on was Tropical_Us, and he moves back into the final Charity Shield spot. A horse named Noah And The Ark won at 14/1 today, but our noah4x4 didn't have the same luck, and he drops out of the top three for the first time this season. That Stevenage win gave TheHappyGooner a "mrhappy 1-0", and moves them up two places. Also going up two places is thrillseeker thanks to that good Newport 1-0 pick, that gave his first 3 pointer this season. 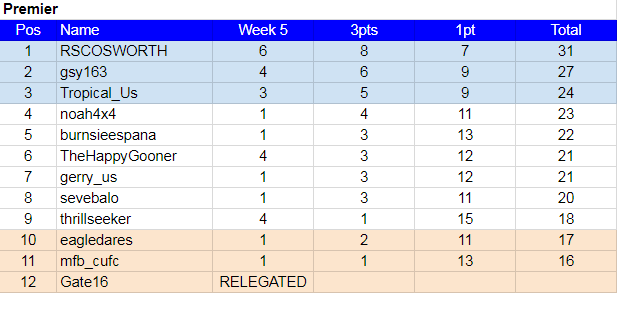 In Division One After his blistering start to the season, just the two outcomes for Colukev, but it was still enough to increase his lead by a point. With the five behind him all getting one point each ghughes11 takes advantage, and having the Barnsley 1-1 spot-on, moves him up five places, and back into the play-off spots. The other main mover in this league was Daniel, and getting the Stevenage 1-0 spot-on helped him go up four places. 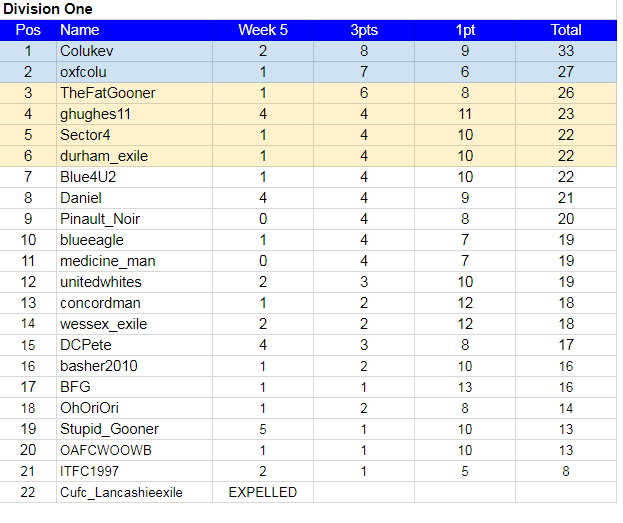 After missing his fourth week in a row i have no option but to expel Colu_Lancahireexile from all Happy League competitions. Again I hope that nothing serious has happened to them, and they are welcome to come back again in future. I don't have a problem with anybody dropping out, but please let me know if you don't want to carry on, rather than me having to expel you.